Malaysia is one of the best places to retire in Asia right now. A couple can live comfortably in a luxury ocean-view condo on $1,700 a month including rent. The average temperature is 82 F year-round, and you’ll find some of the best beaches in the world here. There are cool hill stations, mountain retreats from the time of the British Raj, islands to hop or explore by yacht, and healthcare is second-to-none. 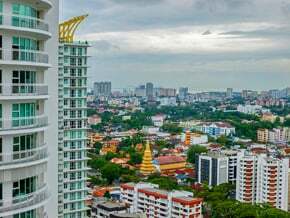 Below are three of the best places to live in Malaysia. Kuala Lumpur is a thriving city of about 1.6 million people. Expats living there have all of the conveniences of the Western world mixed with a Malaysian flair. There is a good public transportation system consisting of buses and trains, but taxis are common throughout as well. It isn’t just the capital of Malaysia; it is the largest city, too. There are thousands of restaurants serving up everything from local noodle dishes to Australian steaks and burgers. There is an abundance of shopping malls with high-end stores like Hermes, Gucci and Jimmy Choo (who just happens to be Malaysian) as well as favorite stores like Zara, Topshop, and H&M. It isn’t all about shopping and food, there are plenty of sites to visit, from the largest twin buildings in the world, the Petronas Towers, to Southeast Asia’s largest bird park. Penang is an island off the coast of Malaysia and is about a three-hour drive from Kuala Lumpur. It is connected to the mainland by two bridges. It has a much slower paced lifestyle than Kuala Lumpur but still has most of the Western amenities. Even though it’s a small island and the circumference can be driven in about three hours, expats are never bored there. It’s the food capital of Malaysia and people from all around Asia flock there to eat the local delicacies, but there are plenty of 5-star restaurants to choose from as well. It’s also a nature lover’s paradise with the world’s smallest national park right on the island. But you don’t have to go to the park to be at one with nature, the botanical gardens are popular for hiking, monkey watching, and just meandering through its lush gardens. It is only about 15 minutes outside of George Town, the capital and biggest city on the island. In 2008, George Town was listed as a UNESCO heritage site, so there is no shortage of historical sites to chose from. There are malls, movie theaters playing the latest American movies, and plenty of secluded beaches to picnic on. Penang, an island off the coast of Malaysia, is just one of the many great options you have if you decide to move to Malaysia. It’s a relaxed lifestyle with all the comforts of home. Most expats live near the beaches in Tanjung Bungah and Batu Ferringhi. Malacca, on the Southwest coast of peninsular Malaysia, has a population of over 850,000 people but still has a small town feel. It’s a port city that is about a three-hour drive from Singapore. There is small expat community already established there, some owning bars and restaurants and others retired. The Malacca River runs through the town giving it a quaint charm. Hop aboard a river cruise to see all the riverside cafes, murals, and monitor lizards that make the river their home. There is a strong Portuguese, Dutch and British influence that can be seen in many of Malacca’s historical buildings and museums. It was also named a UNESCO World Heritage Site in 2008, so there is plenty to see here. If your are into antiquing, Malacca is for you with artifacts to be found from all over Asia. 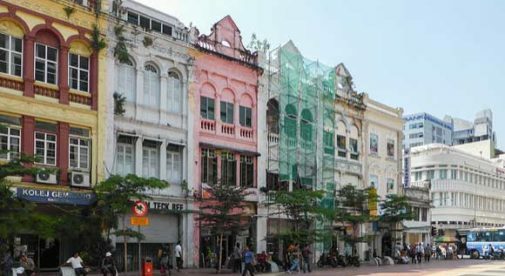 At night, Jonker Walk is a street in Chinatown that has a weekend night market and lots of bars and restaurants to choose from when you want a break from shopping. The food here is different from in other parts of Malaysia–more seafood based with plenty of Portuguese influence. Learn more about Southeast Asia and other countries in our daily postcard e-letter.